For other uses, see Blackhouse (disambiguation). A blackhouse (Scottish Gaelic: t(a)igh-dubh [t̪ʰəˈt̪u]; Irish: teach dubh) is a traditional type of house which used to be common in the Scottish Highlands, the Hebrides, and Ireland. The origin of the name blackhouse is of some debate. It could be less than 150 years old and may have been synonymous with inferior. On Lewis, in particular, it seems to have been used to distinguish the older blackhouses from some of the newer white-houses (Scottish Gaelic: taigh-geal [t̪ʰəˈkʲal̪ˠ]; Irish: teach geal, teach bán), with their harled (rendered) stone walls. There may also be some confusion arising from the phonetic similarity between the dubh, meaning black, and tughadh, meaning thatch. Although the Lewis blackhouses have a look of real antiquity, most of the upstanding ruins were built less than 150 years ago. Many were still roofed until the 1970s but without the necessary annual repairs deteriorated rapidly; as people moved into more modern dwellings with indoor plumbing and better heating, most have fallen into ruin. However, blackhouses are increasingly being restored, especially for use as holiday accommodation. The blackhouses on the Isle of Lewis have roofs thatched with cereal straw over turf and thick, stone-lined walls with an earthen core. Roof timbers rise from the inner face of the walls providing a characteristic ledge at the wall head (tobhta). This gives access to the roof for thatching. Both the animals and occupants shared the same door, living at different ends of the same space. 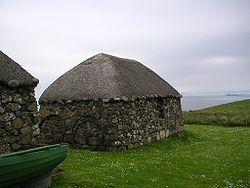 Several long ranges, or rooms, were usually built alongside each other, each one having its own ridgeline giving them the very distinctive look of the Lewis blackhouse. The immediate origins of the blackhouse are unclear as few pre-eighteenth century examples have ever been excavated. One reason for this is that, unlike their later counterparts, the early examples may have been made of turf and thatch and quickly returned to the earth once abandoned. As one of the most primitive forms of the North Atlantic longhouse tradition it is very probable that the roots of the blackhouse, in which cattle and humans shared the same roof, is well over 1000 years old. The Lewis examples have clearly been modified to survive in the tough environment of the Outer Hebrides. Low rounded roofs, elaborately roped, were developed to resist the strong Atlantic winds and thick walls to provide insulation and to support the sideways forces of the short driftwood roof timbers. ^ Fenton, A 1978 The Island Blackhouse and a guide to The Blackhouse No. 42 Arnol. HMSO, Edinburgh. ^ "Blackhouses". Isle-of-lewis.com. Archived from the original on 2010-01-19. Retrieved 2010-03-30. ^ Walker, B & McGregor, C 1996 The Hebridean Blackhouse. Historic Scotland Technical Advice Note 5, Edinburgh. Wikimedia Commons has media related to Black houses. The Blackhouse of the Highlands on "Dualchas Building Design" with good drawings and plans.